PRIVACY. It's the word of the year from dictionary.com. With reports of the NSA turning the internet into a vast surveillance platform, FBI agents and hackers monitoring citizens through home appliances, web-browser tracking cookies multiplying like rabbits, and information you post to social networking sites yourself, the loss of individual’s online privacy and the extensive access of personal data became a mainstream topic in 2013. In an interview about security issues with SC Magazine, Vincent Steckler, AVAST's CEO said that the next aspect of security that needs consideration is privacy. Both consumers and corporates are going to need social media protection capabilities, including checking of links for malware, better control of privacy settings, and control over apps. That goes for tracking in browsers as well. Raise your hand if you use your smartphone to surf the web, compare prices, or buy movie tickets? (That looks like most of us.) Lots of people don't realize that mobile brands, apps and websites 'track' their online movements. Vlček said there are plug-ins that remove things like tracking from ad networks, analytics services or Facebook's Like buttons without breaking the service. He suggests this approach is an important piece of the puzzle for privacy protection. AVAST experts agree that no matter which method cybercriminals choose; mobile malware, targeted attacks, data collection via browser extensions or privacy intrusion and collection of personal data online - all things that bugged AVAST users this year - it all boils down to the attempt to abuse and monetize users’ personal data. It’s essential for users, not just to keep up with the latest in technology, but also to protect their devices and data with the latest security solutions. AVAST recognizes an increased demand for respective solutions and predicts that in the upcoming year an increased amount of people will be looking for effective means of privacy protection. avast! Free Mobile Security and the upgrade to avast! Mobile Premium keeps you safe from malware and malicious apps, stops hackers from stealing data, and identifies potential privacy risks, so you know how much info you are really providing to each app. 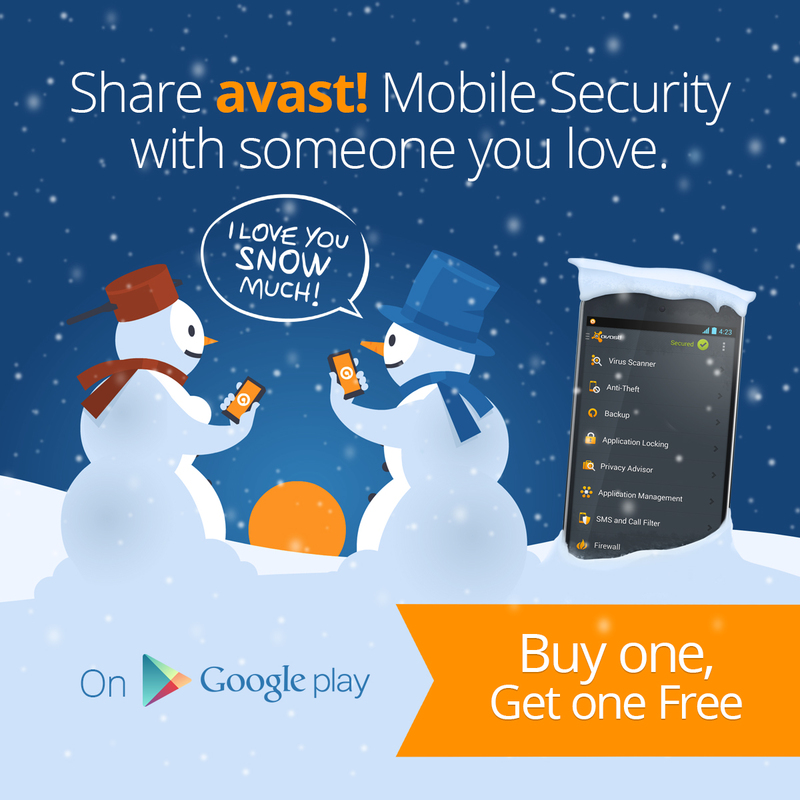 To get this offer, install our top-rated avast! Free Mobile Security app, then click on the Go Premium! button on the phone's user interface and follow the instructions.